The kitchen has become the heart of the home. In the past, families would gather in dens, dining rooms and living rooms for family activities. These were the places where kids would do their homework while parents watched on. These were also the places where kids would watch shows like Sesame Street and learn about letters, number colors from great characters. You might have fond memories of your parents helping you do homework that you worked on at the dining room table. You might also have memories of the family gathered in the living room reading or watching television or listening to the radio. But that has all changed. Today, families gravitate to the kitchen, where all of the day’s activities are done. The kitchen is where kids do homework while mom prepares dinner. The kitchen is where the Bluetooth speaker is located and used to listen to NPR and other shows. 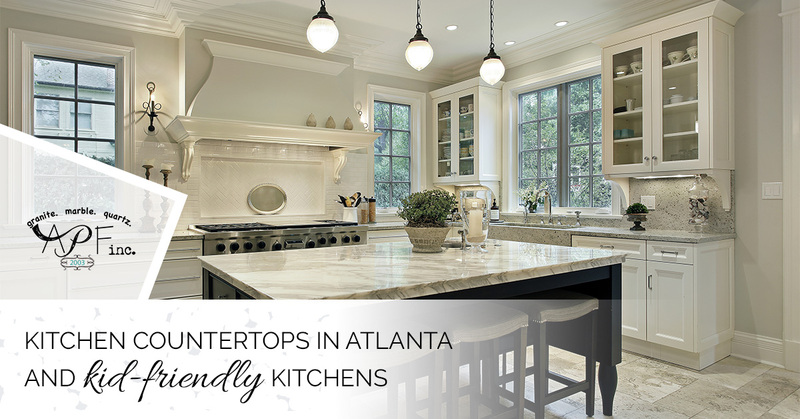 A Polished Finish, your kitchen countertop connection in Atlanta, offers you ways in which you can have a happy and healthy family-friendly kitchen. Find a set of non-slip, colorful prep bowls and have your kids help you bake cookies or make a cake by measuring out the necessary ingredients. Some prep bowls are also measuring cups and you can teach your children that green is one cup, red is 1/2 cup and so on. It is a great way to learn fractions. Let your kids stir the ingredients together, it takes time to master how to hold a bowl with one hand and stir with the other. Vegetable and potatoes peelers come in a variety of fun shapes and interesting characters. For example, you can get peelers that are shaped like monkeys or cats and apple slicers shaped like apples. Peeling fruits and vegetables is a whole lot more fun for the kids when these novelty peelers are used. A hand mixer is a little big and might be intimidating for younger kids. However, immersion blenders are small and easier to control making them ideal for kids who want to help in the kitchen. These types of blenders are perfect when you want your kids to whip up some eggs for a scrambled egg breakfast. They can also help puree fruit, mix batters and whip cream. Cutting boards made of hardwood are heavy and cumbersome and can easily slip out of place, which can be discouraging for kids. Plastic, flexible cutting boards ate lightweight and tend to hold their place on the countertop much better than their wood cousins. Of course, you will be the one who dices the ingredients for whatever dish you are creating, but the kids can help out by dumping the diced goods in the mixing bowl. Because the cutting board is flexible, most of the chopped goodies will actually go in the bowl instead of on the floor. Batter dispensers are great for filling muffin and cupcake tins, they are also great for making perfect pancakes. The best thing about batter dispensers is that they enable kids to help out with these tasks without making a huge mess. Think about it, kids don’t always have a very steady hand. Cracking open eggs is very exciting for kids, but separating the yolk from the whites is a difficult task at best. Lucky for you and your kids, you can invest in an egg yolk separator in an adorable character. You might prefer a stiff spatula to flip a burger or a large pancake, but your kids would probably opt for something softer and flexible. A flexible spatula enables kids to flip eggs and crepes with a little more ease. Kitchen gloves give kids an extra layer of protection while doing tasks in the kitchen. There are any numbers of injuries kids can suffer in the kitchen including burns from hot cookware to scrapes from the cheese grater. So put your mind at ease knowing that your kids are protected from the dangers of food prep. The kitchen really is the heart of your home and where the entire family loves to gather. Give your kitchen the updated look it deserves with new countertops from A Polished Finish. Contact us today.